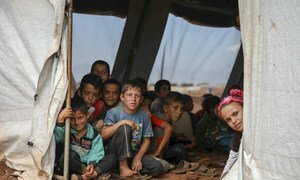 More than six in 10 children globally lack access to social protection, leaving them particularly vulnerable to falling into chronic poverty, the UN said on Wednesday [6 February 2019], warning also that some governments are cutting State cash entitlements, amid continuing economic uncertainty. Photo: UNICEF/Wathiq Khuzaie | A joint ILO-UNICEF report is urging action to ensure that social protection reaches all children, like 6-year-old Mustafa who works with his father in an industrial area of Baghdad, and protects them from poverty and deprivation. Highlighting China’s success in achieving universal health and pension coverage in just four years, is an example of what can be done. The ILO official maintained that “ultimately, the extension of social protection is always about Government’s will. It is because a Government realizes about the important developmental impacts of protecting people, particularly those that are vulnerable, across the lifecycle, so in times of childhood, in old age, in times of maternity, protections are particularly needed.” (SOURCE: UN News).